This past year, I finally went ahead and rolled over my Roth IRA from Betterment to Vanguard. It’s been a long time coming. Indeed, a year ago, I wrote a post about how I was going to do exactly that – then, of course, I procrastinated and did nothing for the next 12 months. What held me back was a combination of laziness plus a little bit of apprehension about how to roll over my Roth IRA directly to Vanguard. After finally taking action and completing this process, I can safely say that rolling over my Roth IRA from Betterment to Vanguard wasn’t difficult. In fact, it was pretty painless and further reinforces my belief that the best Roth IRA investing strategy for the new investor is to start with Betterment or Wealthfront, then switch over to Vanguard later down the line. In today’s post, I’m going to walk you exactly how the whole rollover process works. Taking a step back, the strategy I recommend to most new investors is to start your investing career by opening up a Roth IRA with a robo-advisor like Betterment or Wealthfront. Then, after you save up for a few years and are more comfortable with how investing works, roll over your Roth IRA directly to Vanguard. I’ve written about this strategy in more detail in this post, but here’s a quick summary of my rationale for this. What holds most of us back from investing isn’t necessarily that we don’t want to do it. I think it’s really that the process of opening up a Roth IRA at a traditional brokerage like Vanguard or Fidelity isn’t really intuitive, and truth be told, can be downright scary for the new investor (I know it was for me when I first started investing). None of us wants to mess up when we start investing, and as much as those of us in the personal finance world like to think that anyone can open up a Roth IRA and start investing without any issue, it really isn’t as simple as just telling someone to go open up a Roth IRA. When you’re coming in with no knowledge base (and let’s face it, we all start out in this position at some point in our life), just telling someone to do that is basically gibberish. It doesn’t help either that the interfaces for traditional brokerages like Vanguard and Fidelity aren’t particularly intuitive. I know this because I was in this exact same position just a few years ago. I had no idea what a mutual fund was or how to invest in anything – and of course, when confronted with something that requires some effort, most of us default to doing nothing. However, instead of defaulting to doing nothing, I opted instead to start out my Roth IRA with Betterment. It brought me comfort in knowing that, even though I had no idea what I was doing, I was at least investing my money correctly. The advantage of starting out your Roth IRA with a robo-advisor like Betterment or Wealthfront is that these companies make investing so easy that it’s basically comparable in difficulty to opening up and funding a bank account – something that even the most financially challenged of us can do. By using a robo-advisor at the beginning of your investing career, all you have to do is focus on putting money into the account while the robo-advisor goes ahead and invests it for you in an appropriate and responsible way (I believe every major robo-advisor is a fiduciary as well, which means they have to invest it appropriately for you). You basically can’t mess up when you get started like this. Yes, you’re paying a premium for this service – 0.25% of assets under management typically – but I think that’s a fair price to help make investing super easy. We all pay premiums to get others to do things we can’t figure out, and even telling someone to invest in a target date mutual fund means that you’re okay with someone paying a premium to do something that they could do on their own for a lower cost. And honestly, a 0.25% management fee isn’t going to be the reason you can’t retire. I’d be perfectly comfortable with having someone use a robo-advisor for their Roth IRA forever if that’s what works for them. And if you’re not comfortable with paying any sort of management fee, go ahead and use a free robo-advisor such as WiseBanyan or M1 Finance (the only reason I don’t use them is that I’m not sure what their long-term business model will be and they charge a fee to roll over funds, which doesn’t work well with my strategy). To understand the importance of making investing really as simple as just putting money into the account, consider this. I started investing for real when I opened up a Roth IRA with Betterment back in 2015. However, almost a decade earlier, I’d actually opened up a Roth IRA with E*Trade after I read The Automatic Millionaire (one of my formative personal finance books and one that I still think is worth reading). That book told me I needed to get a Roth IRA started, so of course, I went and did that. The problem was, I didn’t know what I was supposed to do after I opened it. Long story short, I ended up investing all of the money I put into my Roth IRA into Borders stock. A decade later, I had $0 in that account. It was a wasted decade and something that could have been avoided if robo-advisors like Betterment, Wealthfront, WiseBanyan, or M1 Finance had existed back then. These robo-advisors would have literally changed my investing life. Now that I’m pretty well-versed in how money works, I don’t have a lot of need for a robo-advisor like Betterment or Wealthfront. As a result, it makes sense for me to just move my funds out of those robo-advisors and do it all on my own. This saves me the 0.25% management fee, which can save me a lot of money in the long run. Once you’ve gotten more comfortable with investing and understand a little more about how it works, it makes sense to go ahead and just move it out of those robo-advisors and do it all on your own. With all that said, let’s go into the details on how to roll over your Roth IRA from Betterment to Vanguard. 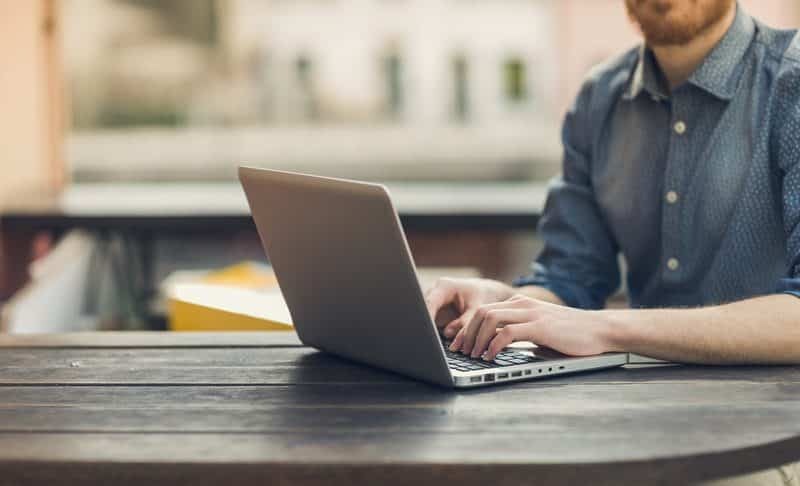 Naturally, the first thing you’ll need to do if you want to roll over your Roth IRA from Betterment to Vanguard is to open a Roth IRA with Vanguard. The process to do this is straightforward – just go to the Vanguard website and select “Open An Account” (this should normally be found in the top right corner of the main page). When you start opening your account, one thing you’ll need to think about is how you want to fund your Roth IRA. Vanguard gives you three options – an electronic bank transfer, a rollover from an employer plan, or a transfer from another financial firm. When I opened my Vanguard Roth IRA, I actually needed to fund it for the last tax year, so I funded it initially with a transfer from my bank account. 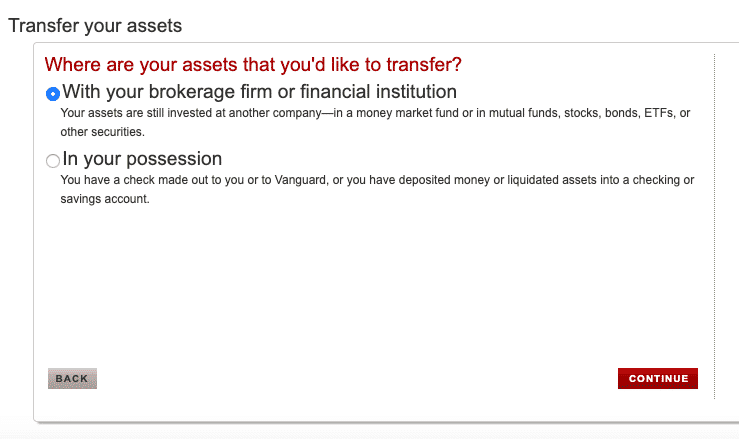 If you’re only rolling over funds from Betterment (or Wealthfront or any other brokerage), then you’ll want to select the “transfer from another financial firm” option, then follow the steps to initiate the transfer, which I’ll go over in the next section. 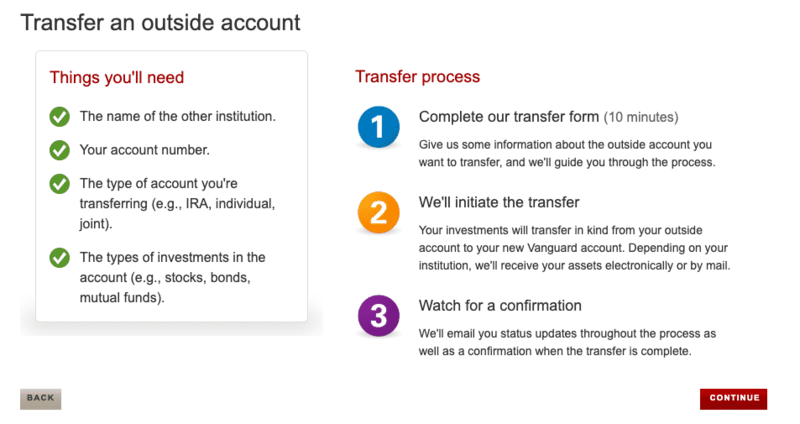 Next, Vanguard will lay out the transfer process for you. As you can see, you’ll need to complete a transfer form and mail it to Vanguard. Vanguard will then send that form to Betterment and Betterment will then transfer your funds to Vanguard. On the next few pages, you’ll enter your brokerage firm, the type of account you’re transferring, and all of the relevant account information. Vanguard will auto-fill the brokerage firm information, so all you have to do is type in Betterment and it will auto-fill it to Betterment Securities, which I guess is the official name for Betterment. From there, continue with the remaining steps, which are all pretty self-explanatory (you’ll fill in what you’re transferring and answer some other questions about your account). One of the more important questions you need to answer is what to do with your dividends and capital gains. Make sure to select “reinvest” so that all of your dividends will automatically be reinvested when you earn them. Finally, once you’ve gotten through all of those steps, you’ll end up at the “review and e-sign” page. Sign the form and submit it to Vanguard. Once you’ve done that, you’ll be given instructions to print out the form and mail it directly to Vanguard. I just stuck my transfer form in a regular envelope and dropped it in a regular mailbox. Once you’ve mailed off your transfer forms to Vanguard, you’ll then need to do a little bit of waiting. I don’t remember the exact date I mailed my transfer forms to Vanguard, but I think it took a few weeks for Betterment to process it and transfer the funds over to Vanguard. You’ll note that Vanguard warns it could take 4-6 weeks to process, which is pretty accurate. To get a sense of how long the entire rollover process took, I mailed off my transfer forms to Vanguard sometime towards the end of February/beginning of March. Betterment transferred my Roth IRA funds to Vanguard on March 12th. Vanguard received my rollover on March 22nd, and it was available for me to invest on March 26th. Ultimately, the entire transfer process meant that my Roth IRA funds were not invested for about 14 days. That’s not too bad. With your money now transferred directly to Betterment, the final step will be to actually invest your rolled over funds. There are a lot of ways you can invest – far more than I can detail in this short post. Instead of going into all of your options, I’m just going to discuss what I did. I’ve always been a fan of the Simple Path to Wealth by JL Collins, so I invested 100% of my Roth IRA into VTSAX (that’s the Vanguard Total Stock Market Index Fund). This fund is super low cost and, for the most part, you won’t mess up if you choose to invest solely in this fund. 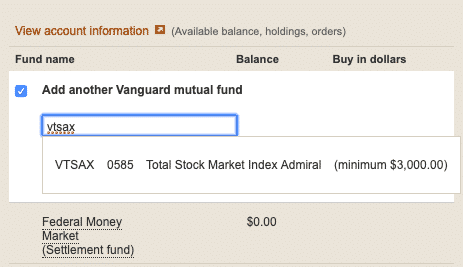 Next, click on “add another vanguard mutual fund,” then type in VTSAX. You’ll then select that fund, then indicate where the funds are coming from. They should be coming from your Vanguard Settlement Fund. Note that sometimes, you’ll end up with a few bucks in your Vanguard Settlement Fund, so make sure to invest those few bucks in as well so that you end up with all of your money invested and $0 in your settlement fund. And that’s it! Pretty simple and easy. I recommend you also download the Vanguard app so you can keep track of stuff on your phone. The most important thing though is to avoid messing with your investments. Once you’ve picked what you want to invest in, don’t mess with it anymore – you’ll probably never make money if you jump in and out of the market. This is retirement money anyway, so just let it ride for the long term. I still believe that for most people, starting with a robo-advisor like Betterment or Wealthfront is the ideal way to get started investing. While investing isn’t actually difficult, at a practical level, it isn’t that easy either. Vanguard, Fidelity, and all of the traditional brokerages are, in all honesty, not very intuitive. I know this because I’ve been in that same position of opening up a brokerage account and having no idea what I’m supposed to do next. So start with Betterment or Wealthfront first if you have no idea what you’re doing. At some point though, you might be comfortable enough that you can figure things out on your own. Once you’re there, then I think you should just roll over your funds directly into Vanguard and save yourself the 0.25% management fee that most robo-advisors charge. Thankfully, as I hope I showed you in this post, the process of rolling over a Roth IRA from Betterment to Vanguard is pretty simple. Why limit this to your Roth IRA? Why not transfer your taxable account from Betterment to Vanguard? Good point. I just happened to write about my own experience with my Roth IRA, but I believe you can do in-kind transfers from Betterment to Vanguard for taxable accounts, so you can do the same thing with taxable accounts without any tax consequences. I’ll update the post with an addendum to point this out. I would add that you can make a good amount of money by transferring to other brokerages instead of Vanguard, or as intermediate steps on the way to Vanguard. I transferred my $100k traditional IRA from Vanguard to Merrill Edge and got $250 for it to sit there for 90 days. I then transferred to TD Ameritrade and got $500, but now it needs to sit there for a year. After that, it’s on to the next one. This whole time, it has been invested in Vanguard low fee ETFs, and each brokerage has paid for any account closure fees from the previous company. It’s just another option in addition to bank and credit card bonuses. Interesting! I’ve always been into credit card and bank account churning, but never occurred to me to do brokerage churning. As long as you’re doing it in a way that doesn’t result in tax liability when moving the account, then that sounds like a good idea. Bonuses on IRA transfers are not taxable, but taxable brokerage bonuses are issued either a 1099-INT or 1099-MISC. I might start moving our Roth IRA around even though I’ll only get ~$100 bonuses, just because that amount can probably grow to near $1000 over 30+ years and still be tax free when I pull it out. Kevin – good idea on how to demystify the investing process for beginners. How did your Betterment investment do? I guess the return wasn’t worth the 0.25% in management fee. My performance was totally fine. Betterment invests in Vanguard ETFs, so the returns are the same as my general passive index fund investing. The 0.25% fee really was worth it to me because it made me comfortable with investing and I knew that I was investing correctly. 25 basis points (0.25%) is really actually totally fine to me – I can guarantee that if anyone can’t hit their number, it won’t be because of 25 basis points. I have been pretty happy with Betterment returns (aside from the 0.25% fee) and their TLH feature. If I switch to Vanguard (also have a taxable account with them) then this goes away unless I’m more hands on. My question is would I need to cash out of Betterment to move the money to Vanguard for a taxable account? Or does Vanguard allow the same flexibility for a taxable account as it does for a tax-deferred account like an IRA? I believe that Vanguard allows you to do in-kind transfers, which means that you could move your taxable Betterment account to Vanguard with no tax consequences. When I rolled over my Roth from Betterment to Vanguard, they said they cannot do transfers to other institutions but I would have to cash out my position and then send a deposit to Vanguard from my bank account within 60 days. They must’ve updated their practices, good to see. It’s annoying step especially after I got all the documents signed and notarized. Ah. Yeah, in my transfer they just moved everything over for me. All I had to do was send in the form to Vanguard. I’m literally doing this right now. Google’s probably well aware and that would explain why it thought I’d be interested in your blog. This process is very easy, I concur. I did enjoy Betterment and the returns were great since I joined back in 2014 however I’ve developed my own strategy of diversifying my Roth across several Vanguard ETFs and decided to take my route over the inexpensive 0.25% fee. I’m probably in week to now. Betterment has my forms, now just waiting on the check to arrive at Vanguard. One question: of all the stocks you could pick in 2015, why didn’t you choose VTI or AAPL or something? What made you think Borders in a world where Amazon was putting its stranglehold on everyone in that niche? So to your question, I started my first Roth IRA when I was in college in 2007 or 2008 (I was 19 or 20 years old at the time). I opened it after reading Automatic Millionaire, but I didn’t understand how a Roth worked or how investing worked. Since I knew nothing, I thought Borders was a cheap stock and it was a store I liked going to, so I put all of my money into that. I didn’t know what index fund investing was, or really what investing was at all. I just thought it was like a game – you pick stocks and hope they earn a bunch of money. If you had told me to invest in VTI, I would not have known what that meant. In 2015, I opened up a Roth IRA with Betterment since I didn’t know what I was doing and didn’t want to mess up. Basically, starting with Betterment helped me avoid a situation like in 2007. If these robo-advisors had existed back then, it would have literally changed my investing life. I have 3 IRAs in two brokerages. I wanted to have them all in one brokerage. Was going to transfer my E-Trade to my Vanguard account. But had to fill out a lot of paperwork and E-Trade charges $75 to transfer out. So find Vanguard has no transfer out fee and Etrade makes it super easy to transfer from another brokerage. No paperwork, all done online. Took 9 days total. Etrades website and app are way better than Vanguards. Also most of the popular Vanguard ETFs are trade free at E-Trade. Win win for me. Awesome – never even knew Etrade was still relevant these days, haha. The fees to transfer out are another one of the reasons I recommend robo-advisors like Betterment or Wealthfront when starting out. They don’t charge any fee to transfer out your funds, whereas the free robos like Wisebanyan and M1 Finance charge something like that $75 transfer fee. It’s the best, most low-cost brokerage company in the world. The founder of Vanguard, Jack Bogle, is the man who literally invented the index fund and did more to help investors than any person in history to date. Also, Vanguard is structured in a way so its owned by its customers, not shareholders.